The Spatial Sciences Institute is a Sustaining Partner of the U.S. Geospatial Intelligence Foundation (USGIF), the only organization of its kind aimed at bringing together the many disciplines involved in the geospatial intelligence sector to exchange ideas, share best practices, and promote the education and importance of a national geospatial intelligence agenda. SSI Professors of the Practice Steven D. Fleming (COL [R]) and Karen Kemp serve on the USGIF Academic Advisory Board, which is responsible for USGIF’s educational initiatives. COL Fleming is an annual contributor to the USGIF "State and Future of GEOINT." Read the 2018 report and the 2017 report. The USGIF has accredited the USC Graduate Certificate in Geospatial Intelligence. Read more about the USGIF accreditation in USGIF's Trajectory magazine. Richard Windisch ('18 B.S. in GeoDesign and M.S. in GIST student) was an awardee of a United States Geospatial Intelligence Foundation (USGIF) Golden Ticket, a program which supports young geospatial professionals in their professional development by sponsoring their attendance at the USGIF GEOINT Symposium and arranging for high-level introductions to industry leaders. 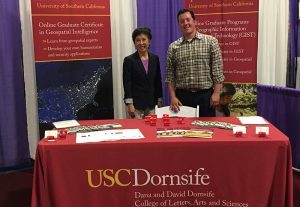 Read about his experiences and those of other USC Spatial students who served as 2018 GEOINT Symposium student assistants. Read about Anne Aryadne Bennett and Courtney Fassett, two USC students who were 2016 USGIF scholarship winners. Look for COL Fleming, SSI Managing Director Susan Kamei, and SSI Academic Programs Director Ken Watson at the 2019 USGIF GEOINT Symposium in San Antonio, Texas.